development of mans thinking, they became abstract concepts symbolising things with different characteristic features. Thus Yang stands for anything that is superficial, energetic, positive, ascendant, rapid, intense, bright, open, out-reaching, hot, etc, while yin stands for anything that is innate, calm, slow, descendant, dark, contracting, closed, cold etc. Everything has its Yin and Yang aspects. Take a mountain for instance. Its yang side faces the sun and is bright and warm, and while its yin side is shady and cool. The human body also has its yin and yang parts, the former including the trunk, the back and the limbs, and the latter including the lower part of the body, the abdomen and the internal organs. Heat in the body is yang, and cold is yin. 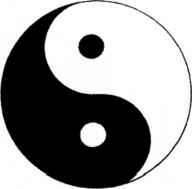 Sometimes the right part of the body is considered yang and the left part yin. Imbalance between yin and yang in the body would result in ailment. Qi as a substance is also divided into yin and yang categories. Yin qi in the natural world is heavy and tends to sink downward, while yang is light and tends to float upward. As far as a man's relations with nature is concerned, there is yang qi existing outside the body and yin qi circulating within it. 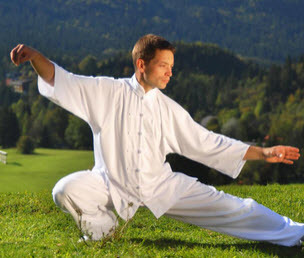 The purpose of qigong exercises is to achieve a better balance of yin and yang not only within the body but also between the body and the external world. Yin and yang are very closely related to each other. First, one cannot exist without the other. Second the two can be transformed into each other under certain circumstances. Third, the two are completely different in nature and tend to restrict each other. Forth, the two are constantly changing and maintain balance, the rise of one is attended by the fall of the other. It is through such endless process of relative changes that thing develop and life is maintained. Based on the balance between yin and yang, and in the light of the of the human physiological features of the human body, qigong exercises are composed of different kinds of, movements and postures designed to improve one's physique. These movements maybe "solid" or "empty", dynamic or static, "open" or "closed," and they maybe performed during inhalation or exhalation - all according to the theory of yin and yang.
" —" (a whole line) for yang and "—" (broken lines) for yin. Secondly, they may be described in the "taiji" diagram (picture 1). The white part of the circle is yang and the shaded part is yin, the two forming the integral whole, resembling two fish chasing each other they represent eternal movement. The black spot in the white region and the white in the black are indicative of the dialectical relationships between yin and yang. The curved line dividing the circle is where yin and yang acquire balance in the court of movement and mutual transformation. 3 The Theories of the five elements and eight diagrams. While concept of synthetic unity and the theory of yin and yang constitute a macroscopic generalisation of the laws of human life, the theories of the Five Elements and the Eight Diagrams provide concrete explanations about the relationships between the different parts of the body. The Five Elements of metal, wood, fire, earth and water are regarded by the Ancient Chinese as the basic elements of nature. It was found that all things on earth, including human beings could be resolved into these five elements, which move through the sheng (creation) and ke (control) cycles in their reciprocal relations (pictures 2 &3). The internal organs of the human body can also be classified according to the Five Elements. Thus , the liver is said to be associated with wood, the lungs with metal, the kidneys with water, the heart with fire, and the spleen with earth. Such relationships form an important basis for the device of qigong methods, including the selection of the body parts for an exercise, the direction in which qi is to be conducted, the method of breathing, with the sheng cycle of the Five Elements. Like Five Elements existing in the external world, the Five Elements within the human body are subject to seasonal changes. Thus the liver, which is associated with wood, is most active in Spring. Such seasonal changes have to be taken into account when one practices qigong for strengthening the internal organs. The Eight Diagrams is another ancient system of cognition about man and the universe. It mainly concerns itself with handling different kinds of information and revealing the laws of changes in nature. qian( =),kun(E H), zhen(=_3), xun( ===), kan(^E), li(EE), yin(-ZT), dui( ==). Actually the Five Elements and the Eight Diagrams are two different manifestations of the same mode of thinking. The relationships between the two may be seen from picture 4. In qigong practice, various parts of the human body are viewed in the context of the Eight Diagrams. The theories of the Five Elements and the Eight Diagrams play an important role in guiding qigong practice. 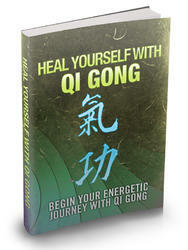 An understanding of these theories is essential to analysing the inner structures of qigong.